HP5710. 512/1Gb. 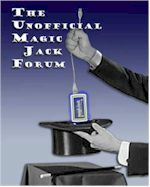 Running Magicjack completely unattended for about a year. t5710, 1.2GHz with 512F/512R. Best bang for the buck. I bought mine on ebay from a guy named statwood87i3. He's a little high but gives phone support after the sale. The 800 MHz t5710s struggle. Mine uses 100% CPU during calls which occasionally degrades the quality a bit. The 1.2 MHz is a much better choice. Is this client works with magicjack? Not that one!! That's a WinCE unit, and a slow one. Unless you're a wiz, make sure to get a TC with Win XPe (as licensed, so it can be easily reflashed), and 512 MB flash with 512 MB RAM, as minimum. The 1000 MHz VIA C3 CPU units (like the Wyse V90) are adequate for the current MJ devices, as are any speed of the VIA C7 CPU TCs (V90L, C90L). Those are the Wyse line, I don't know enough about the HP line to comment on minimum specs, or models.